DRESS UP FOR LETTER P WEEK! “Letter O is for Ostrich Week” was Outstanding, Outrageous and Out Of this world! The share box was Overflowing with great O shares including: Oscar the Grouch, Olives, Origami, Oatmeal, a book about President Obama, and Obviously a few Ostriches made their way in! Read on below to learn about the Letter O learning and fun that took place! For their morning work on Monday and Tuesday, the students practiced identifying the letter O in their writing and tracing activities! Later in the afternoon on Monday and Tuesday, the students had some fun getting silly with the Letter O as they created their lists but also BECAME O’s! Let’s see how you do! Try to make an O with your fingers! Now make an O with your hands. Make an O with your arms over your head! Make a (pointy) O with your legs! Make an O with your Mouth! Something Outstanding happened on Monday afternoon, the students learned that they had received mail all the way from Asia! Miss Justine explained that during rest-time, the Park Prep Academy mailbox received several E-mails all the way from Afghanistan! Miss Justine asked the students to remember the valentines that they had created and mailed out with a PPA Mommy during “Letter M is for Mail Week”. These valentines were painted and mailed to U.S. soldiers (including a PPA student’s Uncle Chad) serving and spending Valentine’s Day overseas. Turns out that the soldiers not only liked the students’ valentines – they LOVED them and took the time to write to the students to say, “Thank You”. 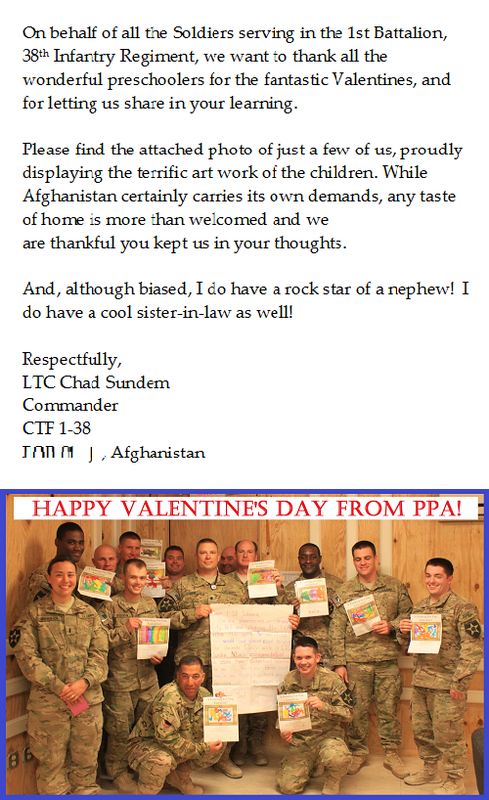 Below is the note from the student’s Uncle Chad as well as a photograph of the soldiers with their valentines! The students were beaming with pride, especially the nephew of Uncle Chad. What an Outrageous way to end the day it was! Thank you to all the servicemen and women of 1-38 for your service and for brightening up our Monday afternoon with your kind Thank You notes! On Wednesday, the students began their Ostrich art exploration! This project was such an exciting one that it would take two days to complete! After reading a special story about ostriches, the teachers informed the students that they would be making their very own ostrich egg! Unlike other bird eggs like robins or pigeons, ostrich eggs are humongous! The teachers pulled up some images on the school’s Ipad to compare various bird egg sizes (and colors). For step one of their morning work on Wednesday, the teachers inflated balloons for the students to paper maché. The students dipped strips of shredded newspaper into the gooey concoction and then draped them around the balloon. At first, the students were a little hesitant to get their hands a little messy. By the end of the project, they seemed to really enjoy the mess! The eggs were set aside in order to dry. As if making an ostrich egg was not exciting enough, the students woke up from rest-time and learned that they would be spending the afternoon with a PPA Mommy visitor! The mommy photographed below and her son had wracked their brains to orchestrate an outstanding letter O-themed obstacle course for the students! Whether is was jumping On, skipping Over, leaping Off, or Opening up, one thing was for sure – the students had an Outstanding time in the Obstacle course! Thank you to the PPA Mommy for creating such a wonderful course for us to play in! Take a look below to see some of the students in action! On Thursday, the students took a break from their ostrich eggs (which were still drying a bit) to create their very own ostrich. Now, these were not Ordinary Ostriches – these were Outrageous Ostriches! Take a look at these colorful ostriches below! During the afternoon on Thursday, the students and teacher celebrated Valentine’s Day! The teachers gifted the students a very special Scratch-Art Valentine along with a yummy cookie from Georghig’s Bakery! The students enjoyed scratching away the paint to reveal their colorful valentine as well as their cookie treat! By Friday, the ostrich eggs had finally dried! After starting the day with an ostrich egg story, the students could hardly wait to work on their eggs! Taking a hint from Thursday’s Outrageous Ostrich art project, the students decided that using different colored paint to create beautiful designs on their ostrich egg shell would be more fun. Boy, were they right! The students’ ostrich eggs sure turned out great! Later in the afternoon, the teachers put together an ostrich-themed technology presentation where they learned various fun facts about ostriches including their head-lowering (not burying – that’s a misconception!) ways and the sounds they make. Do you know what sound an ostrich makes? Click below to find out! Here is a fun animated clip that the students LOVED! Let’s hope the students have an easier time holding onto their ostrich eggs! Well, that is all for “Letter O is for Ostrich Week”. What an outstanding week is was! As always, thank you for reading and have a wonderful weekend!